My year of driving a Mini Cooper in Louisiana. Here are some facts about me. 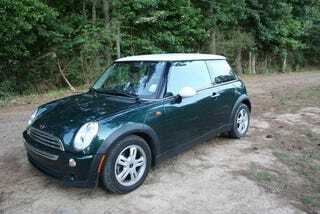 I drive a 2006 naturally aspirated Mini Cooper, I love cars, and I live in rural Louisiana. Being a guy and driving a Mini in Lousiana really makes you pop out. Sometimes this is a pretty fun thing. The closest Mini dealership is over 150 miles away so I have one of only three Minis in town, which makes it kind of like driving a Lamborghini. Every time you stop at a gas station someone's going to ask you about it. Little kids are going to wave at you and ask to sit in it, and people are going to take pictures of your car. Also a fun bonus is that some women love it. I haven't really worked out why, but I honestly don't question a good thing. Also living in the country and having a small car often times requires you to use it in ways that manufactures didn't originally intend. For example, my family owns six horses who need food. This is my car every monday and friday. That's 4 bags of horse food (my high score being six bags, a tractor fuel tank, two twelve packs of tomato plants, and my brother). I also regularly pick up hay bales, 2x4s, and all sorts of other fun things. Also when I go visit my grandma my Mini Cooper pulls double service as a makeshift rally car on a road designed for trucks. But you know what? It does all of this well and without ever complaining. It deals with the little kids asking to sit in it, the idiots who slam it, dealing with dirt and pothole filled roads, picking up two-hundred pounds of horse feed and hay twice a week, the extreme temperatures, and you know what? I love it for it.